1. 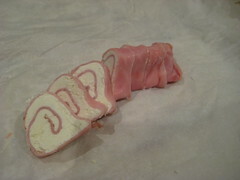 With a sharp knife, make an incision in each hot dog, from top to bottom. Be careful to not cut through the hot dog. 2. 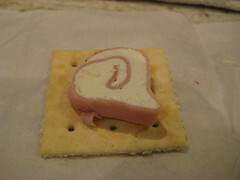 Insert a slice of cheese in each incision. 3. 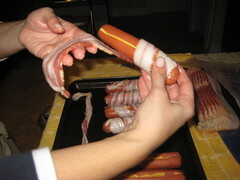 Wrap each hot dog with a raw strip of bacon and use toothpics to hold the bacon in place. 4. Place hot dogs in the oven for 20 minutes. Watch carefully so that all the cheese does not ooze out of the dogs. 5. Serve immediately in a hot dog bun with ketchup, mustard and potato sticks. 1. 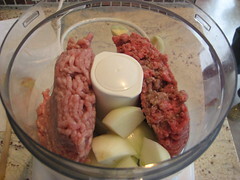 Mix the two meats (chuck/ham or chuck/pork) with the onion, garlic and mustard in a food processor. 2. 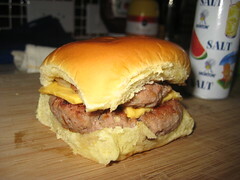 Form 12 mini patties (slider, or frita-sized). 3. 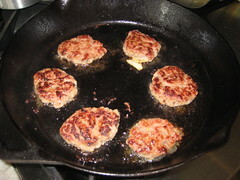 Cook the patties in hot oil until fully cooked on both sides and place a slice of cheese between two patties. 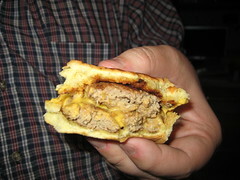 OR - place a slice of cheese between two raw patties and cook the patties in hot oil until fully cooked on both sides. 4. Toast split rolls by placing on skillet with meat drippings for a few minutes. 5. 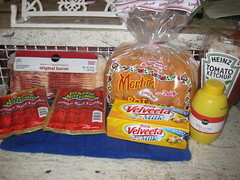 Serve the cheeseburgers on the toasted rolls and season, to taste, with the salt, ketchup, mustard and ketchup. The time had come to let someone in that wasn’t family to partake in The Project. I had gone through fritas and hamburgers by the time I met Sef Gonzalez, the Burger Beast, so we settled on having him come over to partake in the last burger recipe in the book – Cheeseburgers. And, since he was coming over, I took advantage to make Perros Rellenos (stuffed hot dogs), as he also reviews hot dogs from time to time. Being that he was my first celebrity guest, I made sure to invite my family over, as they, too, had been following the Burger Beast ever since last year’s Burgie Awards, where I was asked to give the Burgie to the best croqueta in town (Islas Canarias, of course). I had all the ingredients laid out by the time Sef arrived and when he got to the house, my family took care of making him feel right at home as I organized myself in the kitchen. My mom and the Beast hit it off and had great conversations about Spam and hot dogs in a can (not Vienna Sausages) and before I knew it, we were cooking. 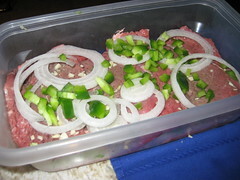 There are two variations to Nitza’s cheeseburger – beef with pork or beef with ham. Since it was a special occasion, I decided to put the Beast to the test and make both so he could decide on the better version. 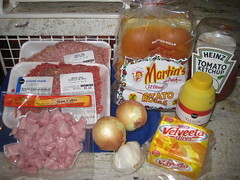 The recipe is so easy, it’s embarrassing – ground beef (80/20), ground pork or ground ham, an onion, garlic and mustard. 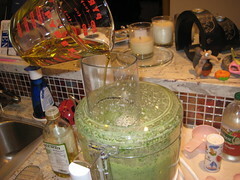 You put all that in a food processor and mix away. Once you’ve got them well mixed, you form a dozen small patties. I used a cast iron skillet for the cooking, which turned out nicely. I cooked them, six at a time in some hot oil. Once they were done, I put a slice of Velveeta cheese (Nitza asks for queso proceso, processed cheese, so I had to use Velveeta) between two patties. Days after, Sef called to say that in re-reading the recipe, we should have actually put the slice of cheese between two raw patties and then cooked them. Either way, these burgers were good. I had to tell the Burger Beast that I wasn’t really a burger fan. My idea of a perfect burger is a Burger King double cheeseburger. I’m just not a fan of the raw meat taste in a homemade burger on a grill. I like my meats cooked medium rare, but there’s something about a burger that just doesn’t do it for me. But, much to my surprise, after trying these cheeseburgers, I can tell you that things have changed. I liked the HAMburger best, but the PORKburger was way good, also. Very strange how something so simple without much fuss, fried up in a skillet in some hot oil could be so good. We ate the burgers as appetizers and decided to have the Perros Rellenos as our main meal. This recipe actually called for a can of hot dogs, which I have never in my life seen. My mom swears they had them in Cuba, and that they were neither Spam nor Vienna Sausages. I just think that’s gross, so thank goodness that our advancement has led us to Hebrew National franks. I went with those. 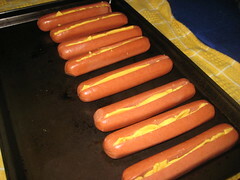 I made an incision in each hot dog from top to bottom, deep enough to be able to fill with a slice of cheese. 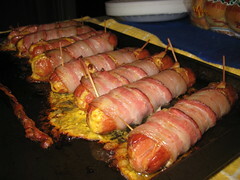 I then wrapped each cheese-stuffed hot dog with a raw piece of bacon and used toothpicks to keep the bacon from unraveling in the baking. Nitza says you should cook them in a hot oven for five minutes – no temperature included. So, I guessed at 425 degrees and I checked them until we reached the doneness I thought we needed – which took twenty minutes. I’ll warn you that there was lots of grease that gathered in my cookie sheet while the bacon cooked. And, Velveeta doesn't prove to be good enough for heat so we lost a good amount of the cheese in the cooking. When you go to remove the sheet with the cooked dogs from the oven, make sure you’re steady or you’ll have grease dripping all over the place. 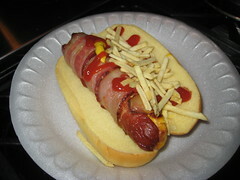 I put the bacon-wrapped cheese-stuffed dogs in a potato hot dog bun and topped each with ketchup, mustard and mini papitas (mini potato sticks). Sef had gone out to get old school fried apple pies from one McDonald’s that still makes them on Kendall and 107th. We had those pies for dessert and between the hot dogs, my newfound favorite homemade cheeseburgers and the apple pies from my childhood, I was in heaven. Weight Watchers flex points were made for just this reason. 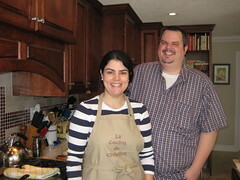 Having the Burger Beast over in La Cocina with my husband, kids, parents, brother and Jackie was a treat and now we’re thinking of the next recipe to cross-blog about. 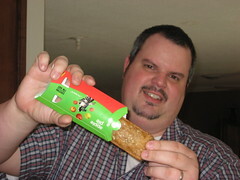 It’s only fitting that I give croquetas a shot, but let me tell you – I’ve got big shoes to fill on the croqueta front. My maternal grandmother’s croquetas were the best around and now that she’s gone, I can only hope that The Project ones are good enough. Luckily, I know that Burger Beast will give you his honest opinion on them. Check out Sef’s version of our cooking session by clicking here. I'll finally be checking one set of recipes off my list - Burgers. Today marks the end of all burger recipes in The Project. That sounds like a big accomplishment, but it really isn't when you look at how many recipes were burger recipes in the book. Three: Fritas, Hamburgers, and today - Cheeseburgers. So, Burger Beast will be at La Cocina today at noon. Am I ready for the close examination and review that will lie ahead? Not ready. But bring it, Beast. Let's see what Nitza's recipe has to offer. 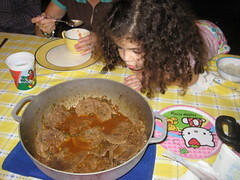 Bistec en cazuela is not one of those recipes that my family would make often. I know it’s one that many of you grew up on, but not in my house. And so, as with many of these recipes, I have no idea going into this, how it’s supposed to look. At least with stuff like tamales and arroz con pollo, you know exactly what the final product is, but with this? No clue. It’s real easy, and extremely Cuban-tasting. Probably why it’s such a staple in so many household kitchens. It gives you instant Cuban house smell, straight from the moment the steaks hit the heat. My favorite part of the recipe? 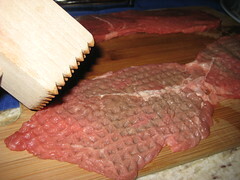 Making little squares as I tenderize the meat with a mallet. Little squares make me happy. Very therapeutic. I know, I’ve got issues. Once you’ve thinned out the palomilla steaks by taking your daily stress out on them, you rub them with minced garlic and the juice of a naranja agria (sour orange). You cover them with green pepper and onions slices and then you let them sit in the fridge for at least half an hour. Once you’re ready to cook the steaks, you heat up vegetable oil and cook the steaks (only the steaks) until golden. You’ve got to fry them up really well and if your cazuela starts to get brown and you think you’re burning your steaks, you’re on the right track. 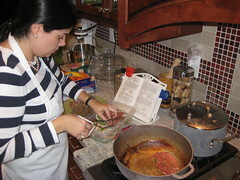 That burning on the cazuela gives your steaks a really nice golden color and is crucial to what comes next. 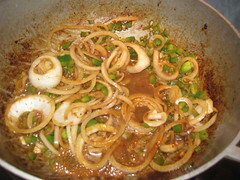 The frying of the onions and the peppers. The brown bits start to release themselves from the cazuela and they stick to the onions and the peppers like flavor boosters. Once the onions and peppers are soft enough, add the liquid and garlic from the marinade to get everyone really swimming in flavor. 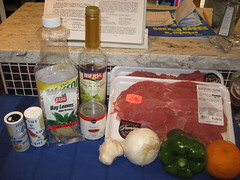 You also add salt, pepper, a bay leaf, some tomato sauce and some vino seco. Add the steaks back in once this juice pool starts to bubble and cover your cazuela. Cook on low heat for thirty minutes. Serve with killer rice. This now makes the fourth of nine cream of vegetable soups. Never ending. I cut up whole carrots and set them to boil. While they cooked, I osterized flour, milk and salt and then added melted butter to the mix. I osterized some more until well mixed. 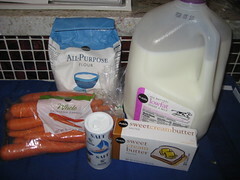 I put the cream base in a pot on low to medium heat until it thickened and then whisked in a cup of the carrots. mashed. Viola, a vegetable. Yes, coated in cream, but a vegetable nonetheless. I found the carrot soup to be one of my favorites thus far. I’ve got spinach, tomato, asparagus, remolacha (is that beet?) and mixed vegetables to go. After this dinner, my whole family smelled like they had walked straight out of a Cuban house, and I loved it. Even the next morning, I woke up to the smell of lingering peppers and onions. Strange to appreciate it, but it really is something special. Maybe this is why we learn, right from the start, that the smell of our food is what draws us in. As some of you may recall, my husband went on his annual guys’ fishing trip at the end of the summer. Well, that was over four months ago, and there is still some fish in the freezer. 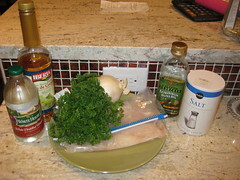 This recipe was picked to help eliminate yet another bag of frozen fish filets – this time, 1 ½ pounds of triggerfish. For those of you wondering, like I did when I sat down to blog, triggerfish is ballesta in Spanish (thanks to my friends Gus and Lourdes for the translation). And, in case you’re wondering, the fish was still good. I think the six month mark is the end of the frozen fish lifeline, I’ve heard. I don’t know if it’s the way I’m jumping around the book lately, but this is one easy recipe. There are two key steps to this recipe: having fresh or thawed out fish ready and having your food processor clean and ready to roll. 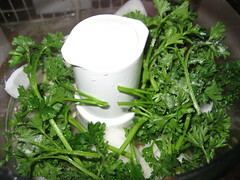 Put the following in the food processor: a garlic clove, a cup of olive oil, a slice of onion, a cup of Peter Hill (ok, perejil, parsley, but I had to say Peter Hill like my father in law loves to say), a teaspoon of salt, two Tablespoons of vinegar and half a cup of dry white wine. If you want to be fancy, you can add the oil like they do on TV, through that hole in the food processor while the rest of the ingredients mix away. 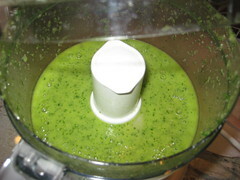 Then, you have salsa verde. 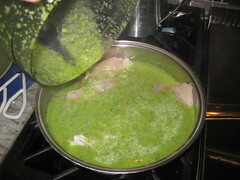 Once you’ve got the green sauce ready, you put the fish filets in a hot pan and cover with the green sauce. Don’t touch them. 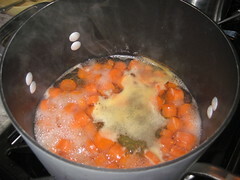 When the sauce starts to boil, cover the pan and lower the heat to low for 15 minutes. 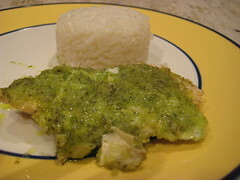 Serve with killer white rice and you’ve guaranteed that while the guys are all salty and gross during their next fishing trip, they’ll be thinking of this dish when they bring home the very clean and very neatly bagged fish filets. Hint, hint, honey. This one is definitely meant to be repeated. I feel a confession coming on…Bless me Father for I have sinned. It has been 18 days since my last cooking session. I don’t know if it was the hangover from the holidays, or the madness of trying to get back into a routine, but I just could not get it together for the life of me to sit, plan and attack another recipe. Until I found this one. Three ingredients? 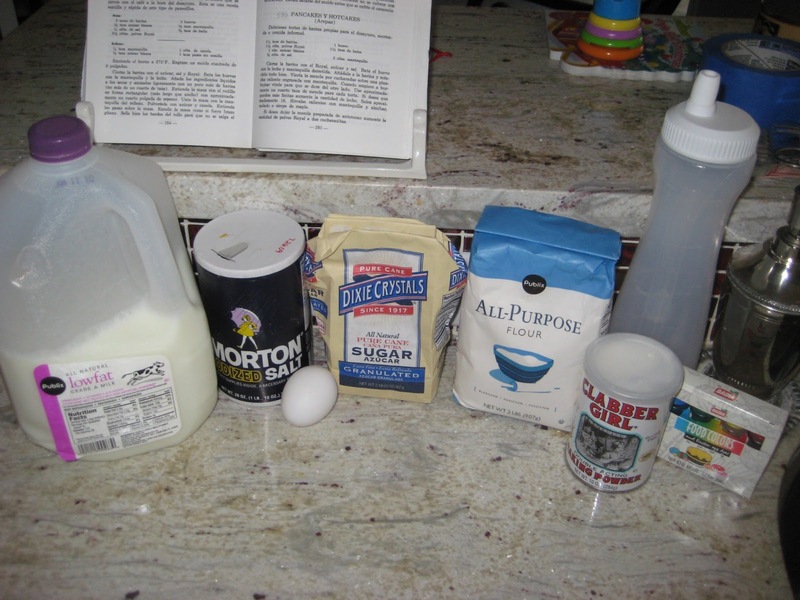 Only three ingredients – this was surely the one to get me back in The Project again. I never knew Nitza even found it acceptable to have a recipe with anything less than seven ingredients. When I was little, I remember my grandmother used to make rollitos de jamón y queso for me as my merienda (after-school snack), but they were always just rolled up ham and American cheese. 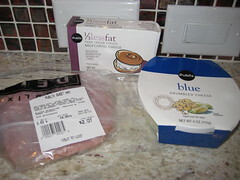 When I read that this recipe had cream cheese and Roquefort (I used Publix Blue Cheese because I couldn’t find Roquefort specifically that day) inside the ham, I was sold. This was like a grown-up merienda. 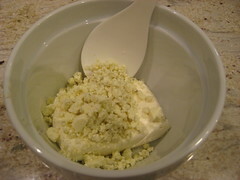 You mix the room temperature cream cheese and half the container of the blue cheese together until you get a smooth paste. 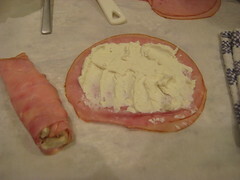 You spread the cheese mix on deli-sliced ham (I used two ham slices at a time because I typically get thin sliced ham) and you roll the ham into a roll. You wrap the rolls with parchment paper and you put it in the fridge for at least two hours. When ready, you unwrap the rolls from the parchment paper and you slice them, sushi style. You can eat them alone, or on top of a saltine cracker. But I must warn you, if you’re watching your calories, take one and run away. This is one addictive treat. And for those of you that aren't blue cheese fans, something happens when you blend it with the cream cheese that really softens the blue cheese tang. I took them to the office in a Tupperware container and they held up at room temperature for a good part of the workday. It wasn’t long before word had gotten out that I had samples from The Project and there were plenty of taste testers involved. Before the day was done, all forty pieces were gone. Make this for your next party and let me know how it goes. Real easy and real good. A typical Saturday morning consists of my daughter calling me, from her room, at around 7 a.m. asking if it’s too early for her to be awake. My answer, every time, is a big, "Yes". She runs to my bed anyways and asks me for homemade pancakes. Not just any homemade pancakes, but Guy Fieri pancakes. You see, last year, we went to the South Beach Wine & Food Festival’s Fun & Fit as a Family weekend at Jungle Island where she got a chance to see her first live chef in action. It was Guy Fieri and he was making colorful pancakes with kids. My husband, the super-project dad he is showed her how to make colorful pancakes at home with a little food coloring and pancake batter. And why not? It’s fun. So this Saturday, not unlike the other Saturdays, she’s working me for colorful pancakes. I respond that we won’t make colorful pancakes today, but we will make homemade pancakes. I thought I remembered that Nitza had a recipe for pancakes. When I found the recipe, I was a little hesitant. Pancakes and Hotcakes, ok. But Arepas, in parenthesis? Why? Arepas we know here in Miami have no resemblance to pancakes and hotcakes. They’re thicker, and well, they’re filled with cheese, but they’re made with corn. No entiendo (I don’t understand). 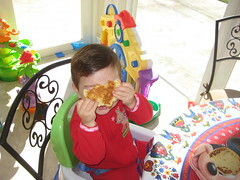 I digress – back to the recipe and the cooking session with my four year old, wide awake and fully rested. The recipe is really easy – you sift flour, polvo Royal (yeah baby, I know that’s double action baking powder, cut in half! 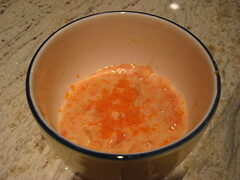 ), sugar and salt. Then, you beat an egg with milk and melted butter. You add wet to the dry and mix it all well. Cuban pancakes are no different in the making than American pancakes (they’re probably not American, so anyone, please feel free to let me know the origin of a pancake). 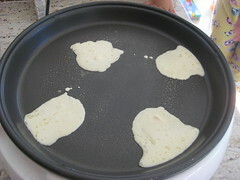 Drop by the spoonfuls or ladlefuls into a hot, greased griddle and flip when you see the bubbles. Well, apparently, there is a difference. 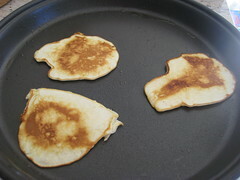 Cuban pancakes don’t seem to like to conform to the usual round pancake form. These pancakes were drooping and running downwards like if they wanted to form a bell-shape. It was very odd. And, these pancakes weren’t browning up at first. The first batch looked like a pasty-white bell. It was icky. 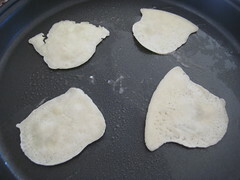 After the second run, the pancakes started to get a tan and the golden resemblance to a pancake was able to be seen, but it was still very strange. They were thin, like crepe thin, which then made me think that I could use this recipe to make crepes, but I don’t have to unless I want to now that I’m done with this recipe (which, by the way is 55 of 629, but who’s counting). So, the kids ate the Cuban pancakes, as I will call them because they sure weren’t American (or French, probably real pancakes originated in France. Correct me, people, please), but I’m definitely not recommending this recipe as a way to make pancakes. They tasted ok, but there are better recipes out there. 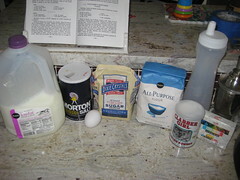 I made real pancakes (down home Southern pancakes) the next weekend, using a 1969 Betty Crocker’s Cookbook recipe. I went all out, actually, and went with a blue colorful pancakes version. The kids were thrilled. 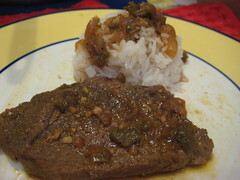 I couldn’t believe how much of a difference there was between the two recipes, using the same ingredients, but there were key differences in the measurements. 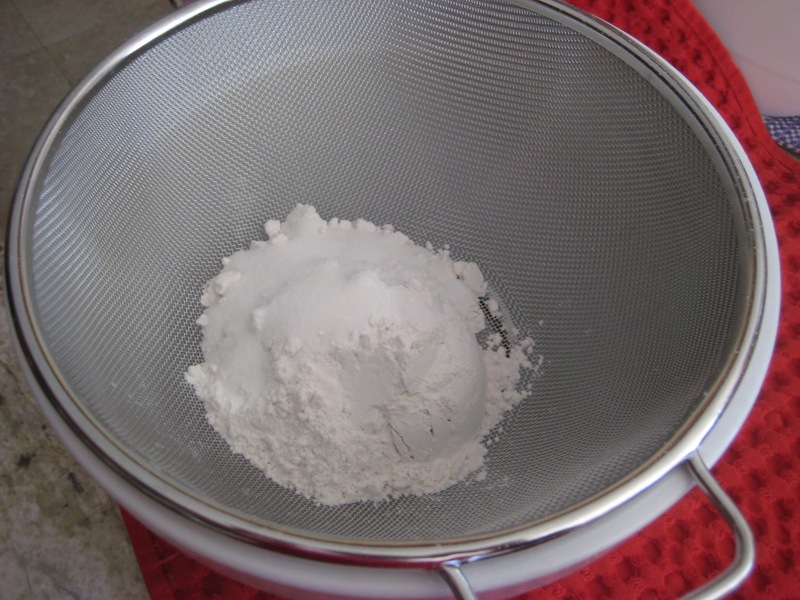 1 ½ teaspoon polvos Royal (double action baking powder, so I used ¾ teaspoon) vs 3 teaspoons baking powder – maybe this is the reason?? There must be something I’m missing in the conversion of trying to work with the polvos Royal. I may need to just keep the measurements intact and see if that helps. If you try to make Cuban pancakes at home, do so at your own risk. I’d stick with Betty Crocker on this one. They tasted like the real thing, not the runny bell-like things I made with Nitza's version. 2. Beat the egg with the milk and melted butter. 3. 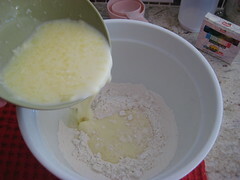 Add the wet to the dry ingredients and mix well. 5. When you see bubbles form throughout the top of the pancake, flip to the other side to finish cooking. Makes approximately 16 medium-sized pancakes.